A bereaved parent panel coaches clinicians about how to have a difficult conversation with patients and families. The photograph hangs in the Marlo Thomas Center Board Room at St. Jude Children’s Research Hospital. Kindergarteners are seated in a row, wearing white caps and gowns, tassels hanging from their mortar boards. The only sign that this isn’t an ordinary kindergarten graduation is the aqua face mask worn by one of the graduates. The hospital helps St. Jude families celebrate kindergarten graduations as well as high school proms and other milestones. Those events are especially important to families whose children have life-threatening diseases. Although 80 percent of children in the U.S. treated for all types of cancer survive, many do not. And many bereaved parents want to turn their overwhelming grief into meaningful work. At St. Jude, these individuals help palliative oncology experts teach staff how to talk with family members of children in active treatment. The bereaved parents teach staff how to deliver bad news. Difficult conversations occur in clinics, hospital rooms, the ICU and other spaces throughout the hospital. According to Erica Kaye, MD, of St. Jude Quality of Life and Palliative Care, these high-stress conversations happen at the time of diagnosis, relapse (or progression), and when cure is no longer an option. Recently, four St. Jude bereaved parents—Leticia Ramirez, mother of Arianna; Lisa Trumbo, mother of Trevor; Andy Featherstone, father of Sam; and Lisa Musser, mother of Thomas—shared their memories of difficult conversations, among other reflections. Their audience consisted of doctors, nurses and other health care staff who filled the Marlo Thomas Center Auditorium for Schwartz Rounds®. A kind word, a smile. Little things matter, said the parents. They encouraged audience members to look for opportunities to commit acts of compassion. A small act of compassion can reverberate through a family, being remembered for years and recalled in times of profound grief. That eloquent advice was extremely meaningful to Musser and her family. But Kaye advises clinicians not to wait to find the perfect words. 2. Take time to nurture relationships. Bereaved parents stressed the importance of time: Health care professionals need to take the time to nurture relationships with patients and families. The presenters remembered doctors who sat down when delivering bad news, answered their questions and allowed for silence—the pause required to process, at least for a moment, the implications of that news. And when all was well, the parents appreciated small talk. Anyone can do it—not only doctors and nurses but staff who work in non-clinical jobs. Featherstone recalled one employee from the hospital’s fundraising organization who took the time to sit and talk with his son about topics other than cancer. “What’s the story?” the employee asked, noticing an open textbook on the teenager’s table in Kay Kafe. “We never want to undermine hope.” said Kaye, describing hope for a cure as normal and healthy. Clinicians need to hope for a cure along with the family, while finding out what other hopes the family harbors. “Big hopes” for a cure and “little hopes” often coexist, explained Trumbo. Honesty and hope can coexist, as well. Parents want open and honest communication: They want doctors and nurses to tell it like it is, so they can prepare for whatever comes next. But that’s not easy to do when the news is bad. “I will be forever grateful to that nurse for being honest when it wasn’t easy,” said Ramirez, recalling a frank, difficult conversation—initiated by a nurse who pulled her out of the hospital room to tell her that her daughter might have less than 24 hours to live. “We were able to get people there in time to say goodbye and to have moments we needed,” Ramirez added. Time to say goodbye: a “little hope” realized. “Communication is a skill—a craft—and it has to be taught, learned and practiced,” Kaye said. Among other projects, the St. Jude Quality of Life Steering Council, consisting of bereaved parents, teaches clinicians how to have difficult conversations. 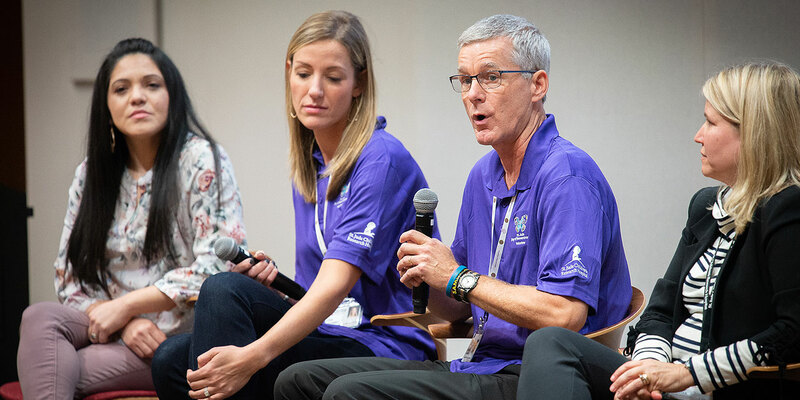 More than 400 health care professionals attended the second interdisciplinary Pediatric Palliative Oncology Symposium at St. Jude, which featured four workshops designed to teach communication skills. The workshops began with a brief overview from a palliative care expert followed by role-play exercises. Participants scooted their chairs together to practice skills for setting up optimal communication and for responding to patient and family emotions with empathy. Posters that summarized this information sat atop easels. During the role-play exercises, clinicians received instruction and feedback from bereaved parent educators. Ramirez, Trumbo, Featherstone and Musser spoke at Schwartz Rounds on the same day as Day of Remembrance, an event designed for bereaved parents and families to honor the memories of their children and to renew connections with staff and families. In the atrium adjacent to the auditorium, bereaved parents and families displayed memory boards they had decorated with photographs. Staff could walk through these memorials, pause and visit. “What can we say or do?” was the question from one member of the Schwartz Rounds audience. Featherstone encouraged people to follow up, by writing their memories and telling their stories. “We don’t have the opportunity to take any more pictures of our children,” Featherstone said. Keith Crabtree, PhD, is a member of the Communications Department at St. Jude Children’s Hospital. How can hospitals shield vulnerable patients from the whooping cough resurgence?